Patrik Lindström EBM The first track on this album is "Disappointment" and if this album turned out to be a bad one I probably would have done a spin-off on it in a try to be funny. Fortunately this isn't a bad album. Rather the opposite in a high amount. Alex P. is the name of the man that's behind Painbastard and stands for all the music, lyrics and everything between. According to himself he have Hocico and LeatherStrip as influences, but I would rather describe this album as following: Take a huge part of Project-X's latest excellent album, mix it with a little modern EBM such as Absurd Minds or Megadump and shake it up with an injection of Hocico. 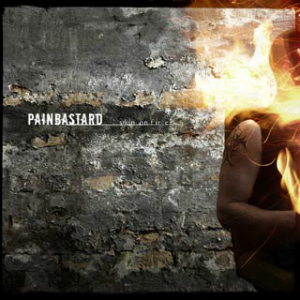 'Skin on Fire' is Painbastard's first album and just the thought that this is a debut album makes me shake, sweat and get breathless like a diabetic with hypoglycemia. Cruel tracks all trough in various BMP but without loosing something on the way. To mention certain tracks are pointless because every one of them is fantastic and the album ends with a slower outro. Just alike the relaxation exercises after a hard gym pass. This is the kind of album that always gets selected when you choose a CD to listen to. Together with "Project-X - Modus Operandi", "Spetsnaz - Grand Design" and "In Strict Confidence - Mistrust the Angels". Praise the Gods, the tax repayment is here. The first track on this album is "Disappointment" and if this album turned out to be a bad one I probably would have done a spin-off on it in a try to be funny. Fortunately this isn't a bad album. Rather the opposite in a high amount.